Barbara Joan (Anderson) Edwards, age 86, went home to be with the Lord on November 3, 2018. She was born on August 27, 1932 in Indianapolis, Indiana to the late Mildred Carlisle and Everett Anderson. She was first married to Charles Crispin and then to Carl Edwards, who preceded her in death in 1996. Barb graduated from Howe High School in Indianapolis in 1950. She held several jobs, including many years at Danners Department Store and in the office of Dr. Gordon Boyd. 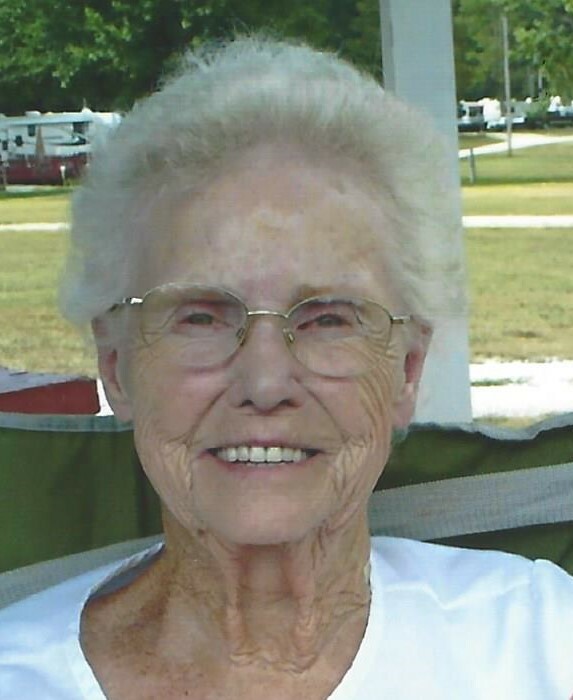 She was a member of Milligan Memorial Presbyterian Church and enjoyed reading, crocheting, watching NASCAR, and spending time with her family. She is survived by daughters, Judy Jenkins and Cindy Edwards; son Garry (Karen) Crispin; step daughter Amy Polly; step son Ralph (Cheryl) Edwards; brothers George (Mary) Tyo and Wayne (Linda) Tyo; 16 grandchildren, 18 great grandchildren, and 2 great-great grandchildren plus 3 on the way. She was preceded in death by her parents; her husbands; daughter Laurie Turpin; son-in-law Rod Jenkins; step daughters Liz Vannice and Patti Wray; step son Doug Edwards; sisters Phyllis Pettis, Kay Hendrickson, and Joyce Mills; and a brother Bill Pallikan.